Wrapped in the green forest of summer, Casa del Rio Riverhouse is a tranquil place to relax and enjoy the winding, cool water of the beautiful Guadalupe River. Guests reside in a lovely stone and stucco cottage overlooking the river below. Fall colors tantalize the senses as we progress to the stark beauty of winter with sight of the cliffs and hills. All through the year the starry night is ablaze at this tranquil retreat. This beautiful property offers water, wings and wildlife for photographers and nature lovers, quiet seclusion for romantic getaways, and a comfortable, river-centered atmosphere for family fun. Whether looking for the perfect setting for a family gathering, or just a respite from the daily grind, you will find it under the huge Cypress and Chinkapin Oak trees at Casa del Rio Riverhouse! The Riverhouse has 2 bedrooms with a king bed in one bedroom, and a queen bed and a twin trundle in the other bedroom sleeping a total of 6 people. The house also has a full bath and includes central heat and air. The living/dining area has a cathedral ceiling, stone wood-burning fireplace, 3 cushion sofa, and a comfortable side chair with a coffee table and beautiful rug. The kitchen is fully equipped with all the dishes, silverware utensils and pots and pans you need to prepare a meal for 6. It also has a microwave and dishwasher making preparing a meal easy and fun. A spacious private outdoor area overlooks the river, and includes a table with 6 chairs, 2 lounge chairs, 2 rocking chair swings hanging from a stately old Chinkapin Oak tree, and a large rock fire pit for roasting marshmallows and enjoying a warm fire. Enjoy all this while listening to the timeless sound of the river flowing amid the rocks and sprawling Cypress trees. Abundant wildlife, featuring Whitetail and Axis deer adding to your enjoyment while staying at Casa del Rio Riverhouse, your Hill Country retreat. Famous TX Resort Area! : We are within a 5 mile radius of many private boys and girls camps, and a mile away is Crider’s rodeo and dance hall a tradition since 1927. The nearby Hunt Store is a familiar landmark in these hills where cowboys and city folk share stories while sitting by a warm fire or eating a delicious meal. Fredericksburg, a popular shopping place, is only a 45 minute drive away. Our area is also known for its art, music, arts & crafts, outdoor summer plays, wineries and antiquing. We welcome you as our guest, happy that you are here, and will greet you warmly, making you instantly feel at home. Vacationing in Hunt has been a Matteson family tradition since 1930. Family patriarch and businessman Lewis W. Matteson Sr. and his wife Lillian Hall Matteson came from the Dakota Territory to Texas around 1917 to make Houston their home. Lew got his start with W. D. Cleveland & Sons selling groceries to the soldiers fighting Poncho Villa in south Texas. He continued on to find success in a variety of arenas including outdoor advertising and banking, significantly impacting the Houston community through his leadership and entrepreneurial spirit. The Mattesons first became acquainted with Hunt in the late 1920s at the invitation of Houston Mayor Oscar Holcombe. Lew and Lillian fell in love with the rustic, picturesque beauty of the Hill Country, and in 1930 they established their home-away-from-home, Camp Dakota, on the South Fork of the Guadalupe River just east of what is now Casa del Rio. The Mattesons, together with their children, Sarah Belle, Buster (Lewis W. Matteson Jr.), and Jeanne, enjoyed many years at their Hill Country retreat. Thirty-eight years after Camp Dakota was first built, Buster Matteson and his wife Betty Dykes Matteson bought neighboring property Casa del Rio to continue with tradition and make a place for their own children to discover what Lew and Lillian first fell in love with in Hunt. Generations of Mattesons are still enjoying this legacy. Casa del Rio is a beautiful 50 acre property right on the river. It is the river that beckons guests from near and far, with its unique properties of clear, clean water, and tree lined with huge cypress and oak trees, and with a backdrop of 300 ft hills. Its river frontage boasts both narrow and wide, shallow and deep, rushing and calm water textures. The variety of wildlife, including Axis and Whitetail deer, Big-Mouth bass, catfish, wood ducks, fox, many species of birds, and even a Blue Heron, inspires a spirit of adventure and the land begs to be explored. A stay at the Riverhouse is comfortable as well as outdoorsy, a get-away retreat experience with every convenience of home. The owner is nearby in order to handle any question or need, yet guests maintain autonomy both within and outside the Riverhouse. Casa del Rio's flexible accommodations make it suitable for one guest or parties of 6. We offer the beauty of the hills and river, comfort, and convenience. Join us! Maximum occupancy of 6 guests is based on many factors, including our septic system capabilities. Casa del Rio is in a resort area in the Texas Hill Country, surrounded by hills, huge cypress trees, private summer camps for children and scenic drives. Casa del Rio is unique as a 50 acre property right on the Guadalupe River, surrounded by the hills and trees of the beautiful Texas Hill Country. The village of Hunt is a mile away, and provides a restaurant, post office, and The Hunt Store, famous as a gathering place for many years. The Riverhouse is on the river, and provides several swimming and fishing areas. There are both narrow winding and wide deep river areas. Waterfronts are available in 2 areas, and easily accessible. The Riverhouse is perched above the Guadalupe River, which is easily visible from the windowed living/dining room. Picturesque rock stairs lead down to the clear, cool water of the river for swimming. Gentle rapids and our swimming area are easily visible and just down the hill right outside the windowed Riverhouse living/dining area. The view of our deep water area upstream is just a few short steps from the doorway. The Riverhouse is perched above the Guadalupe River. Picturesque rock stairs lead down to our swimming area and gentle, shallow rapids. A wooden footbridge takes you to the other side of the river. Walk upstream along either bank or through the shallow rapids to the canoe launch in our deep water area. Dining and Kitchen area adjoin. Table seats 6. Spacious, private lawn area in back of Riverhouse. Property includes a large lawn area between Riverhouse and canoe launch, suitable for outdoor activities such as Frisbee. Picnic table nearby. There are 2 canoes with paddles and life jackets provided to canoe to a wide part of the river to a waterfall. You may also Bring your kayak for a great experience in a beautiful clean, clear river. Spacious, private outdoor patio area in back overlooks the river. Includes dining table and chairs for 6 people, and 2 rocking chair swings, and also a large rock fire pit. The house has 2 bedrooms each accessible to bathroom and living area without disturbing people in the other bedroom. There is one bathroom. The large living area has a stone fireplace, dining area and kitchen with a cathedral ceiling. There are 7 windows that overlook the river, the many trees, and the hill beyond. 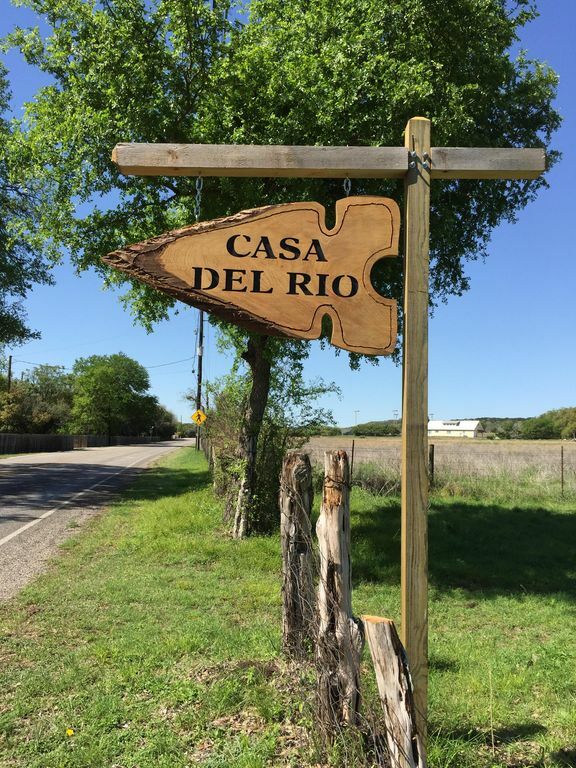 Casa del Rio is located on an unusually beautiful stretch of the Guadalupe River. A stay at the Riverhouse provides a unique get-away experience, while also offering a great family experience on the river, some conveniences of home, including access nearby to an ATM, 2 restaurants, and even two churches a short distance away. We would love to welcome you to this versatile property deep in the heart of Texas! Stayed here for my niece's wedding at one of the local camps where she and her fiancé met 15 years ago. We need a place close to camp as my daughter and grandkids were in the wedding-we didn't want to do the bunks at camp. This place was perfect. The "boys" enjoyed their explorations over this spacious property while the ladies did hair and make-up off site, and the fire pit with firewood provided was enjoyed by all. The beds were very comfy and the river access and views were wonderful! We were unable to use the provided canoes, vests, and tubes due to the temp but that is just a reason to come back. I especially enjoyed the rocker swings under thr trees. Thank uou Betty! As April rolls around us, and temperatures begin to rise. Pollen fills the air, and gets into our eyes. But out of the dust comes a miracle, growing from the dirt. The fields of Texas emerge, wearing a brand new skirt. And if you look off into the distance, as far as you can see. You’re greeted by an array of color, and the view is all for free. Fields of endless flowers, it’s definitely a Texas thing. Maybe we can come back to Casa Del Rio next year . . . When the Bluebonnets Bloom in Spring. You are a great host, Betty, and me, my wife, and son thank you for allowing us to share your parcel of heaven with us. I can not say enough good things about this beautiful place on the Guadalupe River. The house has everything you could need and was very comfortable. You can tell that the owner has great pride in her property! We spent the majority of our time outside enjoying the water and views. The water is amazing! It was so peaceful. We sat under the huge Cypress Trees and let our stress wash away with the sights and sounds. We will definitely be returning to Casa del Rio! My family throughly enjoyed our time at Casa Del Rio. We enjoyed the river, fishing, and camp fires--lots of laughter and precious memories made. The cabin was a bit dirty, though, and I spent my first hour cleaning the refrigerator, doors, and cabinet doors. The bathroom could have used a good scrub as well. The owners son did stop by the check in on us which was very thoughtful as well. All items mentioned in the listing were present which was very nice! We had charcoal to grill; and smores sticks. The green canoe took on water when we took it out on the river; however, the other 2 canoes available worked well. I think it's likely we would stay here again. I am sorry to have missed meeting you and your family. I am sorry you the cottage was not clean enough, and we have made every effort to thoroughly clean the house and make sure this does not happen again. I am happy you told me about the green canoe, and we will take it out of service until it is river worthy. Thank you for coming, and I hope you will return again. We thoroughly enjoyed our stay at Case Del Rio. The cabin and property are lovely and well maintained and Betty could not have been more welcoming! We enjoyed the feeding the birds and climbing the "mountain." We look forward to coming when the flowers are in bloom and the trees budded out. Thank you for a relaxing and peaceful weekend in your piece of Heaven, Betty! It was wonderful meeting both of you. You are so warm and friendly and it is a great joy to me that you had such a good time. I am so blessed to have this wonderful place and to share it with kind people like you who love nature, and look for beauty, peace and quiet. Thanks for your great review, and may you have a happy life. This location is amazing. Right on the water with options for enjoying the river or hiking without getting into a car. Deep in the heart of the Texas Hill Country, Casa del Rio Riverhouse is on 50 beautiful acres overlooking the Guadalupe River. You can swim, fish, canoe, rock hunt, and enjoy the beauty. Listen to the sound of the river, star gaze at night, and hike in the hills behind the Riverhouse. The winding roads along the river for many miles are very scenic. The area offers art and theatre at the Cailloux Theatre, the Hill Country Art Foundation, the Cowboy Art Museum in Kerrville, and the Point Theatre in Ingram. The famous Kerrville Folk Music Festival and Texas Arts and Crafts Fair are recurring favorites every May/June. In Ingram (7 miles east) there is a dam for dam sliding, swimming and boating. Crider's, established in the 1920s, just 1 mile away, is a rodeo with dining and dancing under the stars from Memorial Day to Labor Day. The surrounding area (within a 4 mile radius) is well known for many private summer camps for children and teenagers. Many of these camps have been operating since 1927. An abundance of wildlife, including whitetail and axis deer, graze in the fields surrounding the Riverhouse. There are many exotic ranches in the area where hunters from all over the country come to hunt bison, sika, fallow, axis and white tail deer, black buck antelope, addax, dama gazelle, aoudad, scimitar oryx and water buffalo. The beautiful foliage of the maple trees in Lost Maples State Park, about 45 miles to the west, is at its peak in November. The area here has remarkable beauty with many hills 250 to 300 ft high. There are cypress trees along the river, as well as pecan trees, oak trees and sycamores. You will love it here and be so welcome. There is a 6% tax added to the rental fee. Rates are subject to change until reservation is confirmed. Deposits apply only to the dates originally reserved and cannot be transferred to a reservation for different dates.